Perhaps Bunnings will have a sausage sizzle at each round , to fund the foray in Virgin Supercars. Obviously all of the Boost stuff has taken place, completely without my knowledge and while I was away on holidays, just after Christmas, Garry texted me and said 'when are you back, we need to have a meeting'. I was like, 'yeah, no problems, back beginning of January, happy to meet', thinking full well it was discussing plans for this year and all of the rest of it. I walked into a meeting and was given the news about Boost and that I'd no longer be driving full-time. Which onion supplier will feature on the car? Mr Hazelwood holds his sausage sizzles at Mitre 10... competition rocks! Interesting to read in today’s Telegraph that Mr Winterbottom is set to shake down his new ride next Tuesday, in a handover session with 888. 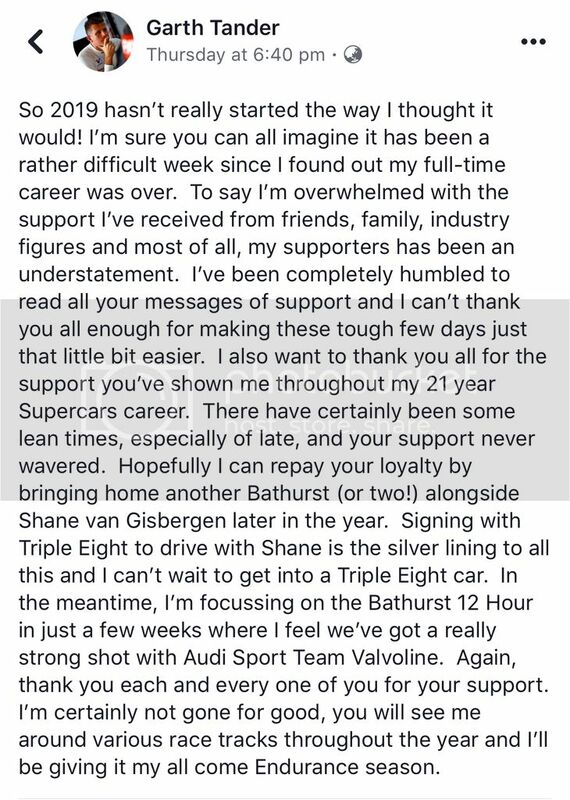 It seems (although not shared in that article) that the ZB homologation muletto used to get aero sign off, and raced by Mr Whincup in Pukekohe last year, is headed Team18’s way. I wonder if CS can continue to penny pinch the speed out of it. Thought that both Team 18 and Tekno was going to get new chassis'? With Mr Henderson the new signing to run the squad..
Frosty is getting the 888 chassis they used to sort the aero. The current T18 VF/ZB is going back to T8 as a spare. Seems like a fair deal!! While Mr Little is going back to Officialdom as Tech Director. Does he get a new jacket, or can he still wear his old one? Which is an utterly moronic mindset to have. Geez so who is going to run TEKNO now. 2 major leaders have now jumped ship to new roles.